The tree images are in-camera double exposures. One exposure is a still shot and the other is made with camera movement (I think it’s worth clicking on the top image to see it larger). Today is sunny, though, and just warm enough for a bit of melting but there’s not too much spring here yet. Wonderful and magical! It was indeed worth it to click on the top image to see it large and glorious. I’ll take your smudgy charcoal bird images over other people’s clear shots any day. Very very beautiful pictures Karen, I absolutely love them. Absolutely what I needed today, to find the mystical beauty in this endless winter. If anyone can make this endless winter beautiful, it’s you. Can’t wait to see what you will do with the spring. the second tree picture is worth seeing it larger too, Karen, I like the composition! great images Karen – I can get totally lost in any of them – transported! 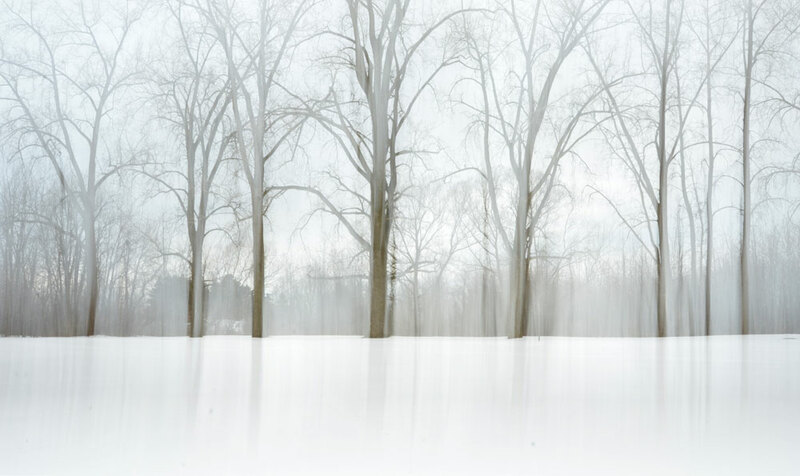 The trees have taken on a ghostly and ethereal quality. Beautiful. Beautiful image ! I like your approach. Genius often hides in simplicity. Simply genius! We still have patches of snow, but yes, those birds are in high spirits! I think it’s contagious. Another marvelous, delicate, painterly, series here Karen. Beautifully dreamy images, Karen! And I love how you posted the last one of the starlings — sometimes it seems like images always have to be technically “perfect” to keep, but to me, it’s the ones that make you “feel” something that are so worth holding onto. something special in these doubles ! It is intriguing that photographers have themes that they get drawn to revisiting. It is as if we have not quite caught that thing that has caught our attention and need to go back for just one more go. And then we see something new which takes the ‘theme’ a step onwards. The snow can give the illusion that images are monochromatic; until you look more closely and pick out the hues that are there. We had a discussion about spring light on another blog and agreed that in the UK the lack of foliage and low angle of the sun tends to make the intensity different to the higher sun of summer. In your pictures it gives this dream-like quality. As usual you have captured the essence of the scenes. Great job. Great shots – the birds are very effective. Lovely, very inspiring work, Karen. Wonderful, intense work. The top image is so beautiful enlarged – shifting between realities. Happy Spring, Karen – hope they’re wrong about the snow. 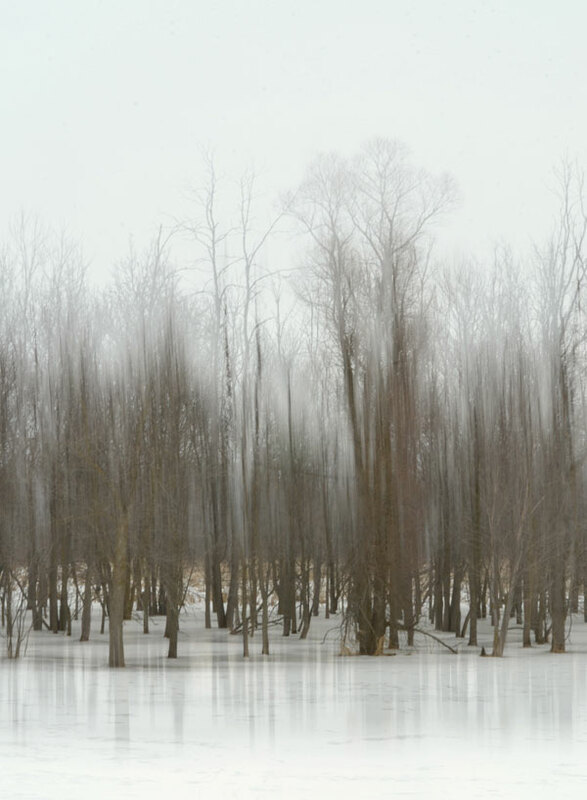 Such an interesting idea – to superimpose a still with a moving photo of the same trees. The results are wonderful and yes, well worth clicking on!! And there are your silvery-subdued colors – shimmering and inviting. Lovely, Karen. I think about your work a lot, especially when I’m in nature most days. I admire and am inspired by how creative you are, always expanding the form. This, as much of your work, is beautiful and haunting (in a good way). Oh my!!! 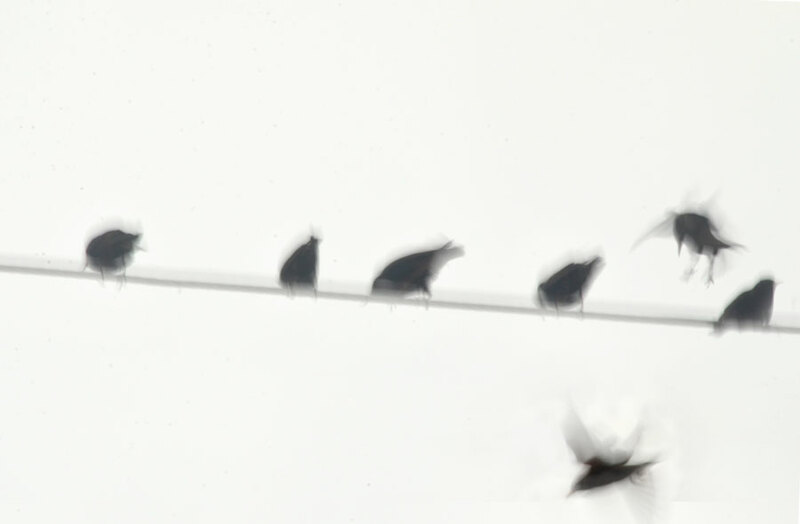 I love those restless starlings ‘vibrating’ photograph, it is full of life!!! Love the soft tones … truly beautiful images. The starlings are illustrated so well with the ‘smudgy charcoal look’. your work is just stunning…. always. Thank you for your comment. its about trying to capture transitions in a form that’s readable. That is what fascinates me about your work where you capture so effortlessly different times and states in the one image. the liminal space when something is there but not quite there. It has the effect on me of being drawn into the image in contrast to other photographs where their clarity somehow makes a visual barrier that prevents my eye from going into the image.